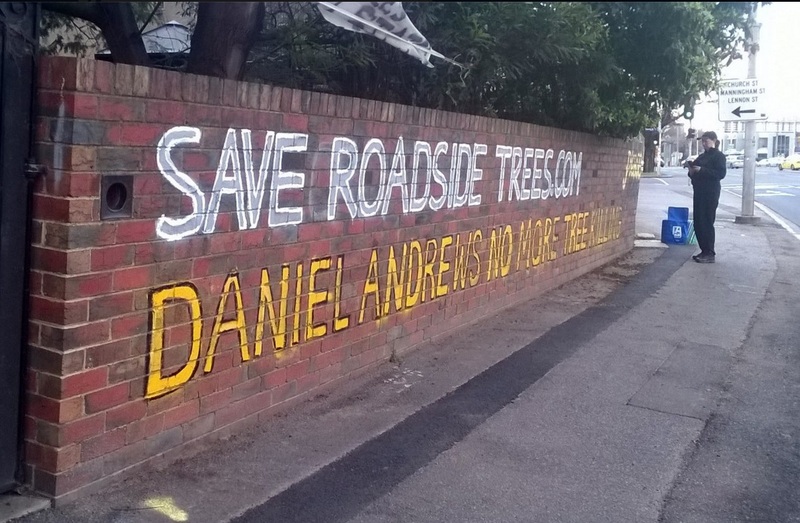 A prominent, highly visible fence on Flemington Rd has been painted with a plea to the Premier Daniel Andrews. The sign also refers to this blog site – SaveRoadsideTrees.com. It’s putting the government on notice that the unprecedented attack on the environment by major projects in both city and country will have consequences. It was unwise of Daniel Andrews and VicRoads to bulldoze through the huge amount of opposition from savvy inner city locals and conservation groups around the state including the National Trust, when he allowed the Lemon-Scented Gum to be summarily cut down last month (27th July)! The opportunity to demonstrate that the road lobby was not one of the most important lobby groups in the state was well and truly squandered.